Estonia’s IPRI score decreased by -0.01 to 7.181 placing it 1st in the Central Eastern Europe and Central Asia region and 24th in the world. Estonia is classified by the IMF as part of the Advanced economies group and by the World Bank as High income country. Estonia’s Legal and Political Subindex did not change and remained at 7.335 with scores of 7.839 in Judicial Independence, 7.488 in Rule of Law, 6.585 in Political Stability, and 7.427 in Control of Corruption. Estonia’s Physical Property Rights Subindex decreased by -0.01 to 7.627 with scores of 7.342 in perception of Property Rights Protection, 9.444 in Registering Property, and 6.094 in Ease of Access to Loans. 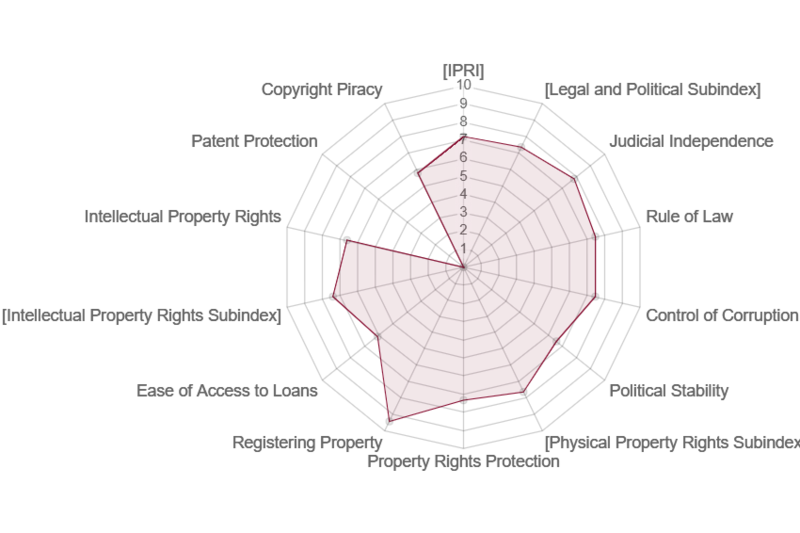 Estonia’s Intellectual Property Rights Subindex decreased by -0.02 to 6.582 with scores of 7.364 in perception of Intellectual Property Protection, data wasn't available to measure Patent Protection, and 5.8 in Copyright Protection.